A rapturous new novel of first love in a time of war-from the celebrated author of The Last Van Gogh. In pre-war Prague, the dreams of two young lovers are shattered when they are separated by the Nazi invasion. Then, decades later, thousands of miles away in New York, there's an inescapable glance of recognition between two strangers. Providence is giving Lenka and Josef one more chance. 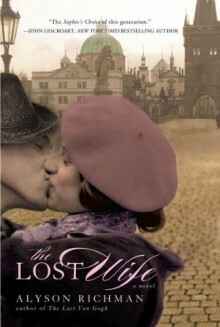 From the glamorous ease of life in Prague before the Occupation, to the horrors of Nazi Europe, The Lost Wife explores the power of first love, the resilience of the human spirit- and the strength of memory. I wish I hadn't read this one immediately after The Storyteller. I loved that one so much that this one couldn't compare so close together.